EdWare was the original language for the Edison robot. EdWare has since been retired, replaced by three other languages: EdBlocks, EdScratch and EdPy. This page contains information and resources about EdWare accurate from when it was retired in August 2018. The EdWare app (available at www.edwareapp.com) will continue to be active and available for use. While there is not currently a set time-frame for deactivating EdWare, we will not be updating the application moving forward. In other words, we plan on keeping the current application available as it stands indefinitely. EdWare is a hybrid graphical robot programming language for the Edison robot. EdWare combines the ease of drag-and-drop graphical icons with increased functionality from text-based entry. The result is a robot programming language that is easy to learn and offers a robust next-step in coding education. EdWare’s graphical icons are controlled by a unique feature, the properties box. This feature allows the main programming section to contain just a simple icon structure to represent the program, while the details of each icon are controlled individually in the properties box. EdWare allows users to create and control variables during the program flow, allowing Edison to have a ‘memory’ of past events and react in more interesting ways to sensor inputs. To help you get started using EdWare, we’ve created a free video tutorial series. 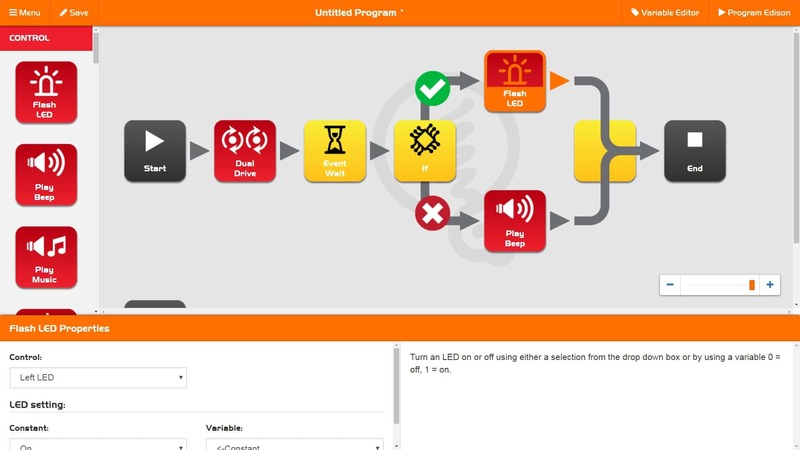 Each of the short videos in the series will introduce an element of the EdWare environment to help you get the most out of using EdWare to program your Edison robot. Be sure to check out the other videos in the series too! These free, downloadable resources can help you get the most out of EdWare. The EdWare lesson plans are designed to introduce programming using Edison and EdWare in a structured way. Each of the EdWare lessons has been designed to be completed in 90 minutes, however, the actual time required will vary based on your students’ ages and abilities. This resource serves as a guide as to how the EdWare lesson plans link to standards and requirements in the Australian Curriculum. 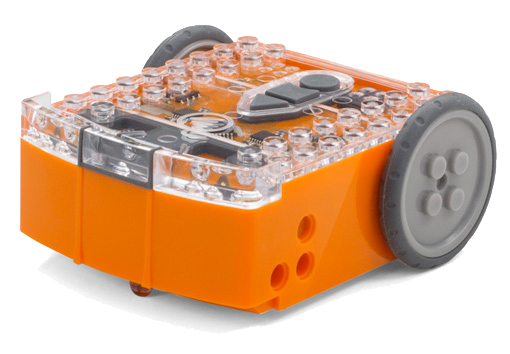 Take the exploration of robotics and coding even further! This activity book is perfect for additional independent exploration of Edison and EdWare beyond the lesson plans. Designed for use outside the classroom or as an independent extension, students will learn more about how to write their own robot controlling programs using the EdWare programming software. Looking for EdBook3? The original EdBook3 required the LEGO Compact Tracked Loader kit, which has been discontinued by LEGO. You can still access the EdBook3 activity book here. Give your students the opportunities to program solutions to real-world robotic challenges using EdWare and EdCreate, the Edison robot creator’s kit. Multiple programming challenges using the EdCreate EdBuilds are available in the EdCreate teaching guide. Or unlock your student’s creativity and EdWare programming prowess with the EdCreate EdChallenges! How do I access EdWare? Downloadable versions of EdWare of EdWare are also available for Windows, Mac and Linux. You can also get the EdWare app for Android or iOS tablets. How do I download a program to Edison? To download a program to Edison, first connect Edison to your computer or tablet via the EdComm cable. Make sure that the volume on your device is at maximum and all sound enhancements are disabled. Press the round button on Edison one time. Then click on the ‘program Edison’ button in the top-right corner of the app. A new window will pop-up. Follow the instructions on the window and click ‘program Edison’ on the new window. The program will then download into Edison. Remember to listen for the success sound before unplugging the EdComm cable to ensure the program fully downloads. How do I run an EdWare program on Edison? Once you have successfully downloaded a program to Edison, disconnect the EdComm cable from Edison. To run the program on Edison, press the play (triangle) button on Edison one time. This will immediately start your program. How do I know what a block does? Why are the ‘read’ and ‘data’ blocks greyed out? The ‘read’ and ‘data’ blocks will be greyed out until a variable is defined and available for use. The ‘read’ icons look at Edison’s sensors and save the value of those sensors into a variable. The ‘data’ icons perform mathematical operations on data in variables. You can learn more about variables and the ‘read’ and ‘data’ blocks in EdVenture 9 from the EdWare EdBook 2. How do I save my programs? To save your programs in EdWare, you need to have an account and be logged in. You can create an account by clicking on the menu button in the upper left-hand corner of the app. Select the ‘Log in’ option, then the ‘Create Account’ option. Follow the steps to register your free account. Once you are logged in as a registered user, you can save your program by clicking on the menu button in the upper left-hand corner of the app and selecting ‘Save As’ from the menu. How do I delete blocks? EdWare automatically deletes blocks that are not connected into the main programming lines. To delete a block, simply drag it out off the line and drop it into empty space. How do I use new events? The ‘new events’ blocks allow a user to make a sub-program begin from a specific event while the main program is running. Perhaps the most advanced set of blocks in EdWare, these blocks emulate the coding idea of ‘interrupts.’ New events allow users to vertically layer programs with secondary programs interrupting the main program when the new event is triggered. To use a new event, drag the ‘Event’ block out from the bottom of the ‘Flow’ group and drop it on top of the ‘New Event’ block in the workspace. When the ‘Event’ block is dropped correctly it will change its name to ‘Start Event’ and automatically generate an ‘End Event’ block on the same row. A new ‘New Event’ block will be automatically generated on the line below. Clicking on the ‘Start Event’ block will show the options for the new event after it has been set. You can also drag and drop program blocks after it in the same way you would with the normal start block. The main start block cannot be removed, because that is the beginning of the main program. When you download your program to Edison, both the main program and any sub-programs beginning with the new ‘start event’ block will download. When the play (triangle) button on Edison is pushed, Edison will run the main program. If the condition of the start event occurs, Edison will run the start event sub-program to completion, then return to the main program and continue the main program. This will happen whenever the conditions of the start event are met. If no blocks are attached to the main program, Edison will end the program immediately after starting it. When using new events it is a good idea to have at least one loop in the main program. How do I use remote controls with EdWare? To use a remote control with an Edison robot in EdWare, you will need to scan the corresponding remote control barcode from EdBook 2 in the ‘TV remote control barcodes’ section. First scan the correct barcode. Then downloaded a program that either uses the remote control read block or the remote control option in a wait event, ‘if’ statement or loop. You can run it like a standard program. Be sure to check out our video tutorials for more information on how to use the different EdWare programming options. What kind of language is EdWare? EdWare is a hybrid graphical programming language that combines the ease of drag and drop with the flexibility of properties boxes. Originally designed for a modular robotics kit in the mid-2000s, EdWare has been extended and reimagined for use with the Edison robot. What age user is EdWare for? The flexibility and usability of EdWare make it perfect for students who are continuing their coding journey beyond the basics. EdWare has been designed for students in school years 5-8. What do different categories of blocks in EdWare do? The control blocks allow the user to directly control Edison’s outputs. Driving, making sounds, turning on sensors and lights can all be done using control blocks. The read blocks allow the user to store sensor information as variables in the EdWare program. The data blocks allow the user to manipulate the information stored as variables in the EdWare program. The flow blocks allow the user to change the way Edison reacts to external and internal information within the EdWare program. Which browsers are compatible with EdWare? EdWare is compatible with Chrome, Safari, Microsoft Edge and Firefox. Is there an EdWare iOS/Android app? Yes! EdWare can be downloaded from the Google Play Store and the Apple iTunes app store. Why isn't Edison doing anything when I hit the 'play' button? Both the line sensor and the obstacle detection need to be turned on by placing down the corresponding red block at the start of the program. Please note, obstacle detection cannot be used at the same time as sending or receiving data. Please always start a line detection program on a white surface. Why isn’t my program downloading? Be sure that the EdComm cable is plugged in fully and the volume on your device is all the way up. If the EdComm cable is not plugged in fully, you will hear a sound like an old dial-up modem when you press the ‘program Edison’ button on the pop-up window. Sound enhancements can also sometimes cause the Edison program to not download correctly, resulting in the fail sound. For more help on sound enhancements, please visit our troubleshooting guide. When many users in a single location, like in a classroom, are downloading programs at the same time, you may experience slower internet speeds. This can cause the program to take longer to generate the ‘program Edison’ pop-up box and for the program to download to Edison. With a very slow connection, you may need to try again. Press the stop (square) button on Edison, then press the record (round) button one time. Restart the download by clicking on the ‘program Edison’ button in the top-right corner of the app. In this tutorial, we look at the parts that make up EdWare and build our first program. In this tutorial, we look at the menu of EdWare and all the options it contains. In this tutorial, we look at the red control blocks which cause Edison to perform actions. In this tutorial, we look at the yellow flow blocks which Edison can use to interact with the outside world. In this tutorial, we look at the green data blocks which Edison uses to perform mathematical operations on data in variables. In this tutorial, we look at the blue read blocks which Edison can use to get more control over it’s sensors. In this tutorial, we look at new events which Edison can use to react quickly to the environment. NOTE: This version works well on devices with sound enhancement software, including most Windows desktop and laptop computers. If you are using a Windows desktop or laptop computer, the SHORT PULSE version should work best for your device. NB- some devices have low audio output but also have sound enhancements. If you are using a Windows device with the SHORT PULSE EdWare installed and your program downloads are failing, switch to the EdWare version 1.0.6 for Windows option. If the EdWare version 1.0.6 for Windows option also fails, you will need to manually disable the sound enhancements on your device. Once these are disabled, use the EdWare version 1.0.6 for Windows option. NOTE: This version works well on devices with sound enhancement software. If you are running a Linux machine and EdWare version 1.0.6 for Linux does not work, try this version instead. NB- some devices have low audio output but also have sound enhancements. If you are using a Linux machine with the SHORT PULSE EdWare installed and your program downloads are failing, switch to the EdWare version 1.0.6 for Linux option. If the program fails using the 1.0.6 option, you will need to manually disable the sound enhancements on your device. Once these are disabled, use the 1.0.6 option. On the newer builds of the Raspberry Pi, the audio output is not high enough to program Edison, meaning additional amplification is required. This can be achieved by plugging Edison into a monitor connected via HDMI, the headphone jack of a powered set of speakers or USB sound card. Visit eBay for low-cost USB sound cards. EdWare for PC, Mac and Linux is open source software. The source files can be downloaded from GitHub. Please use, adapt and share! We want to make robotics and computer science education available to everyone, which is why these teaching resources have been released under a Creative Commons licence. You are free to use these resources as they are, translate them, share them or use them as the base to develop your own customised lessons. Your EdVenture into Robotics- 10 Lesson Plans by RoboticsWPS – Michele Miller is licensed under a Creative Commons Attribution-ShareAlike 4.0 International License. Based on a work at https://www.meetedison.com. Most lessons have been designed to be completed in 90 minutes; however this will vary based on a student’s age and ability. All lesson plans have been linked to the Australian curriculum. Please see a complete list of references at meetedison.com. Technology skills – Students familiarise themselves with the programming environment and how to download a program to the robot. Introduction to sequential programming – Students learn how the robot responds to command icons and bring together the concepts of time, speed and distance. Sequential programing and basic geometry – Students learn how the robot responds to time and geometry and how they can achieve driving control of the robot. Reinforce learning – Students use knowledge from lessons 1 through 3 to achieve two fun open ended activities. Creative thinking and problem solving – Students come up with their own challenge and conceptualise how the robot can provide a solution. Students may select their own topic, state the program’s purpose and explain where it could be used in the real world. 4. Failure – The first attempt is never successful. Document it and Keep trying! 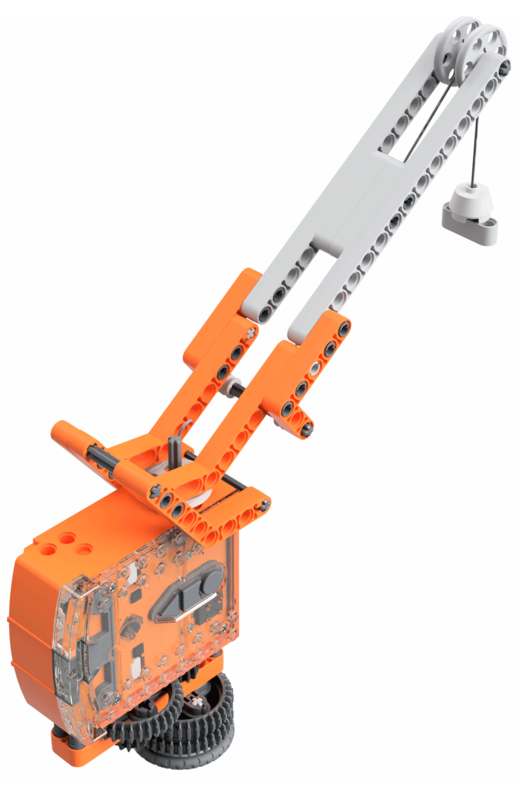 Introduction to inputs (sensors) – Students learn how to make the robot respond to outside stimulus (claps). This lesson also includes a fun class activity. Introduction to the concept of obstacle detection and artificial intelligence – Students program the robot to make decisions (artificial intelligence) in response to obstacles in the robot’s environment. Industrial like robotic behaviour – Students learn about basic robot sensing and control similar to that used in advanced automated factories and warehouses. Environmental measurement and programming mathematics – Students learn about measuring light levels, storing them in memory and performing mathematics to control the robots behaviour.